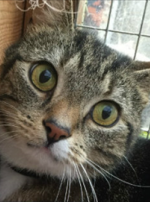 We've been running our Cat of the Month feature since April 2015, so we thought you might be interested in what happened to some of them We will be doing this now for all Cats of the Month so you can follow their stories. Sweet, gentle old Theodore (16) was looking for a quiet, happy home for his retirement. He has arthritis and a heart murmer, both controlled with medication. He's living with a mother and daughter now, and having a lovely time. 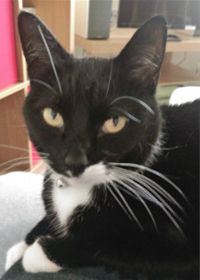 Suki had a difficult life, kicked out after a family breakup, living rough, losing her sister to a dog attack, and with the neighbour that fed her dying. Once she came to us, we found she had heart and kidney problems. She found a lovely home, but her new owner died! 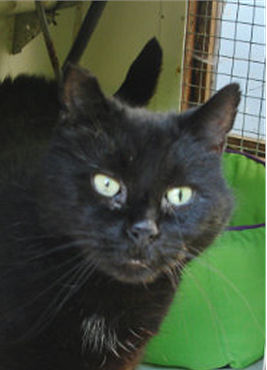 So back she came to us, but now has a happy home with a lady who specialises in older cats, and is settling in well. 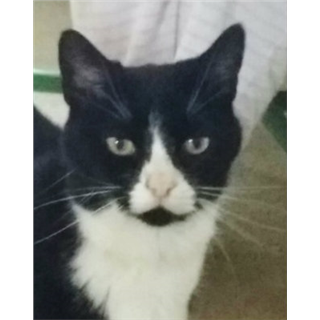 Squeak came to us very timid and shy, from a multicat household. At first, he flinched every time somebody petted him, but he slowly got more used to it, and once he trusted someone, he did enjoy it. He loves his toys, and his dinner, and has a very special purr!! He found his special person, and has gone to live in large house in the country - happy ending! 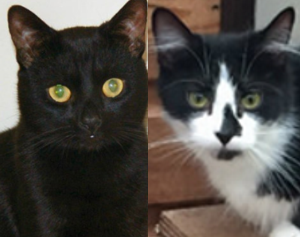 Clover and Daisy are sisters from a family home - and they have gone to another loving family, where they fitted in right away - within minutes of arrival they were both sitting on laps! 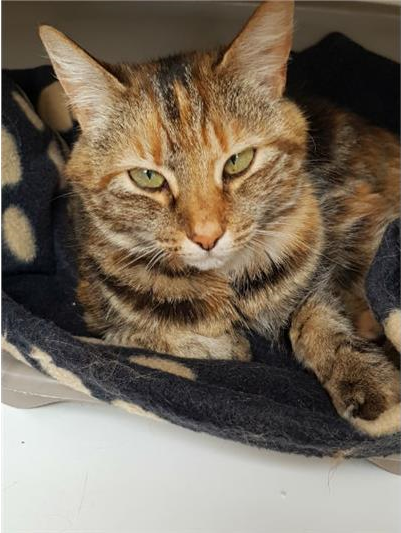 Millie, the little semi-feral cat who needed lots of love and patience before she could relax enough to enjoy the petting and tummy tickles she craved, has gone to a lovely new home along with Misty, who was fostered by the same carer. Misty gives Millie confidence, and they have settled in well. Prince and Bessie were both special needs cats. Prince had only three legs after an accident, and has found a home along with a kitten. 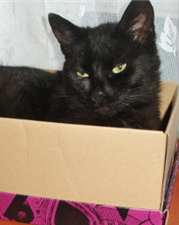 Bessie is blind and needs blood pressure medication. 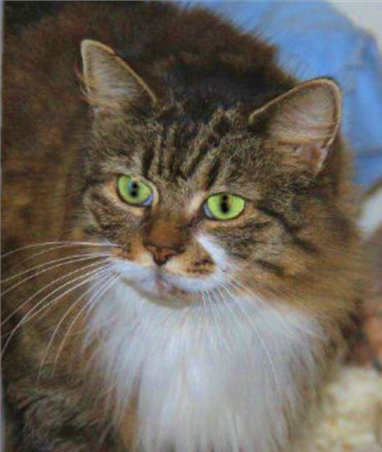 Both a sweet, loving cats and it is wonderful that very special people have come along to give them love and forever homes Eight year old Bella had a lot of changes in her life, and despite being sweet and quiet and enjoying a fuss, ended up in the pen for more than two months, which she did not enjoy. 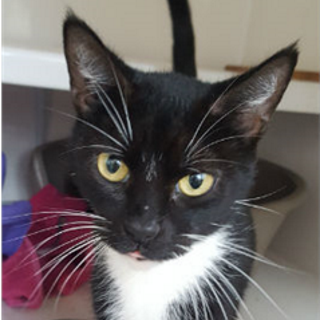 She has gone to live with a gentleman who had just lost his own cat and couldn't face a home without a feline companion. She has settled well and is happy to be home! 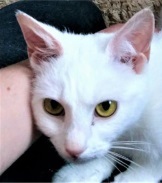 Sweet, gentle, timid Snowflake needed a quiet home without children, and was fostered rather than in a pen. It took a while to find the right people to care for her, but she is now a much-loved pet again. Nelson has fallen on his paws! He used to live on Peartree Roundabout, and has now gone to live with a lady in a five storey house! 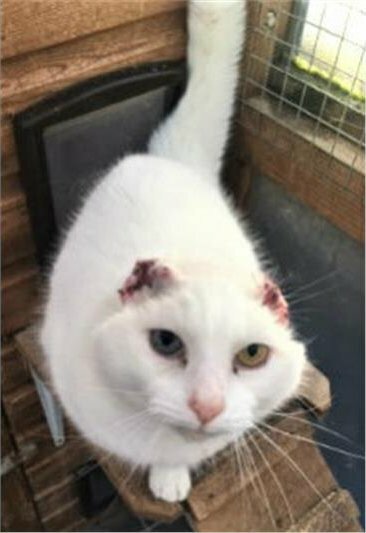 Marble had spent half her life in the pen - for nearly a year, and was sad and hoping to meet someone who would love her.... The first person who visited her, took her home! Swashbucking Jupiter is now in a loving home in Oxford. 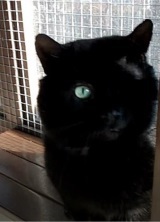 Jupiter was a fighting tom, and contracted FIV during his battles, as well as losing an eye. He now lives indoors and has settled down as a happy house cat. 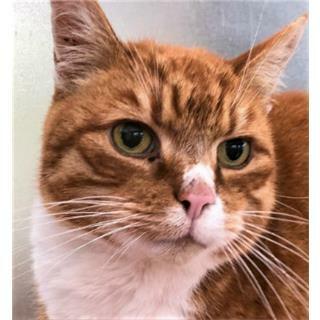 Ginge, a handsome, a friendly 9 year old boy who spent several years as a stray with kind people feeding him and letting him sleep in their garage, has gone to live with a recently widowed lady to keep her company Our Chair's granddaughter fell in love with Wiskas and he is on his way to his new home with her! Ziggy (left) and Oreo (right) are brother and sister, born in June 2016, and came to us with two other brothers and Oreo's three kittens. 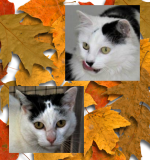 Oreo and Ziggy cared for the kittens together, and bonded well, so we wanted them to be rehomed together. Happily, they have now gone to a new home together. 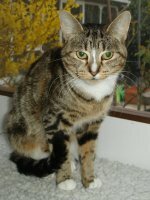 Joey is a sweet, affecionate and talkative girl who wanted to be an only pet, and been confined to a flat all her life. With our fosterer, she had discovered gardens for the first time in her 8 years. 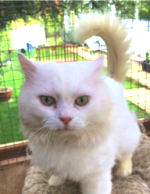 Joey has gone to a lovely home with an experienced owner who knows how to handle stressed cats. 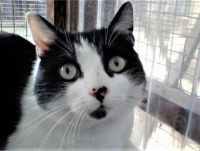 Max ended April still unhomed, but early in May, he was reserved, and has now gone to a loving home Mickey cames from a good home, but his sister bullied him so much that he was afraid to come into the house! He was initially timid and frightened, but never aggressive, and gained some confidence, becoming more and more affectionate. He went to live with a lovely family who will help to build his confidence, and give him lots of fussing. 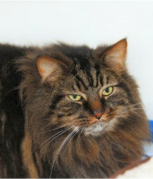 Beautiful Monty is one quarter Norwegian Forest so large and long-haired. He had lived indoors all his four years, with other animals. 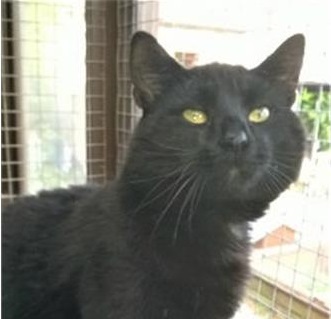 He needed to be homed somewhere fairly quiet and, when he was ready, to be introduced slowly to outdoors, with the ability to run back inside if he wants to! He is really a relaxed and affectionate cat. He has gone to a new home with a garden. Marty had broken her left hind leg and it had to be amputated, but she didn't let being a tripod cat stop her finding a happy, loving home! 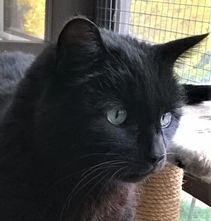 Tiggy, a sweet, gentle, 7 year old, has found a new home where he can relax and enjoy the garden!. 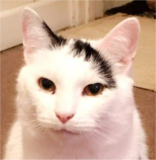 Lola went through a bad time in her 2 years, being bullied by another cat, having two litters and then getting an infection after being spayed. She is now very happy to be the centre of attention in her new home with a couple who love her to bits! 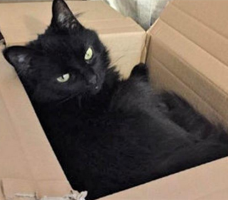 After over 5 months with us, following 2 months in a cattery, Sootywas chosen by a single lady and her 16 year-old cat and it has turned out to be the perfect home for him Indie has gone to a loving new home where she has lots of company but no small children. 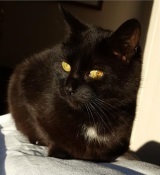 Chloe has a lovely new home where she is an indoor cat, and has settled well. 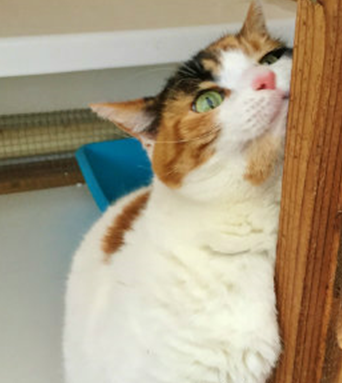 Bonnie was spotted by a disabled lady who rehomed her and is thrilled with her! 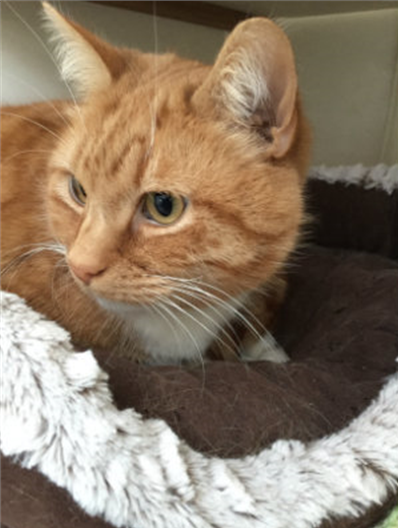 After a few months as our feature cat, timid Mickey has found a happy home and a new name with an older gentleman. After a couple of days hiding under the sofa, he has emerged and now really enjoys lots of cuddles and petting. It looked as though Chloe would have to hang on through May as well to find her new home, but early in the month, a kind older gentleman decided she was the cat for him. 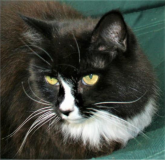 Alfie, a lovely tuxedo cat, came to us just before Christmas as his owner developed allergies. Although he is a quiet cat - except at mealtimes! - he does love company. He doesn't like surprises but otherwise really relaxed and content in himself. 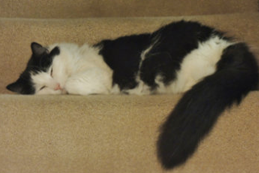 Alfie's fosterer went on holiday, leaving him in the care of a friend - who fell in love with him, and has adopted him! 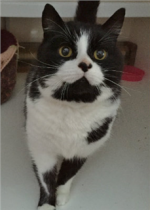 She is a sweet, affectionate cat, 8 years old, who was not enjoying being in a pen. 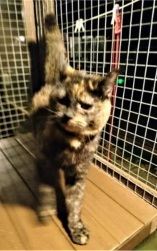 She was homed by us as a kitten and was very happy until the couple had children. She couldn’t cope with a family and moved out of the house to live in the garden. She found just what she needed: a quiet home without small children. These two were only cats of the month for a week before they got adopted! Three year old brothers, they were looking for a new home because their owner moved and couldn't take them with her. 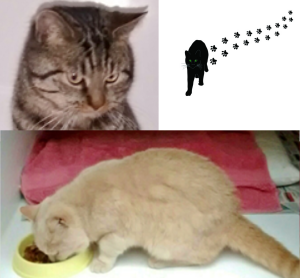 They were homed together, which was great for them because they had always lived together.